I stumbled across this video while searching You Tube for Ultra videos the other day. And it perfectly put into words video what I have been working to correct in my running form over the summer. I over-stride and heel strike something terrible. I’ve known this for a long time but really never set out to do anything about it. 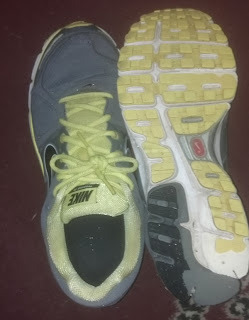 A typical trait of all my running shoes was that I wear out the heels (right more then left) faster then anywhere else. It wasn’t until I watched the DVD on the Western States 100, Unbreakable and witnessed Anton Krupicka’s, running form, that I decided to do something about this. It was during this remarkable video that I noticed how up right and free he ran. I now had a video comparison of a nimble and light running style compared with how hard, heavy impacting, and heel first I ran. I knew I had some areas to improve on. AND another benefit….I GOT FASTER! Now I will tell you I was not sure what I really fixed, until I watched this video and these gals at The Balanced Runner put on video what small changes I made over the summer. Without knowing it…I fixed 2 of the Biggest 5 Mistakes. This entry was posted in Uncategorized on October 2, 2014 by burk.brian@yahoo.com.